Trump's budget proposes massive cuts to the program that provides more than 42 million Americans with food stamps. 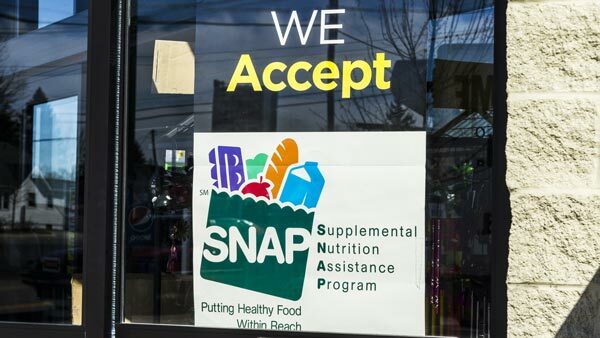 The budget also floats the idea of new legislation that would require able-bodied adults to work or participate in a work program in order to receive benefits under the Supplemental Nutrition Assistance Program, the official name of the food stamp program. The president's budget would reduce SNAP by roughly $213 billion over the next 10 years. The budget calls for a $17 billion reduction in 2019, and proposes "a bold new approach" to administering SNAP that will include a combination of traditional food stamps and packages of "100 percent American grown foods provided directly to households." She said the proposal, if enacted, "would be devastating for the one-in-eight Americans who use SNAP to put food on the table every day." "It would reduce benefits and undercut the program's efficiency and effectiveness," she said. Here is what the budget says: "Reforms the Food Safety Net While Promoting Work. The Budget proposes a bold new approach to nutrition assistance that combines traditional Supplemental Nutrition Assistance Program (SNAP) benefits with 100-percent American grown foods provided directly to households and focuses administrative reforms on outcome-based employment strategies. In addition, the Budget expands on previous proposals to strengthen expectations for work among able-bodied adults, preserve benefits for those most in need, promote efficiency in State operations, and improve program integrity. Combined, these reforms maintain the Administration's commitment to ensuring Americans in need of assistance have access to a nutritious diet while significantly reducing the cost to taxpayers." Under Trump's 2019 proposed budget, U.S. government funding for the space station would end by 2025. The government would set aside $150 million to encourage commercial development. Many space experts are expressing concern. Sen. Bill Nelson, a Florida Democrat who rocketed into orbit in 1986, said "turning off the lights and walking away from our sole outpost in space" makes no sense. Retired NASA historian and Smithsonian curator Roger Launius notes that any such move will affect all involved in the space station; Russia is a major player, as are Europe, Japan and Canada. "I suspect this will be a major aspect of any decisions about ISS's future," Launius wrote in an email. The budget assumes that Congress will repeal and replace former President Barack Obama's health care law, although there's little evidence that Republican leaders have the appetite for another battle over "Obamacare." Repeal of the Affordable Care Act should happen "as soon as possible," say the budget documents. Trump's budget calls for the elimination of the National Endowment for the Arts and National Endowment for the Humanities, two prominent grant programs founded in the 1960s that Trump proposed ending in last year's budget. Under his proposal, the NEA and NEH would "begin" shutting down in 2019 and neither organization should be considered "core Federal responsibilities." Each program receives just under $150 million. Trump's proposed 2019 budget calls for slashing funding for the EPA by more than one-third, including ending the Climate Change Research and Partnership Programs. The president's budget would also make deep cuts to funding for cleaning up the nation's most polluted sites, even as EPA Administrator Scott Pruitt has said that is one of his top priorities. Trump's budget would allocate just $762 million for the Hazardous Substance Superfund Account, a reduction of more than 30 percent. Current spending for Superfund is already down to about half of what it was in the 1990s. Despite the cut, the White House's budget statement says the administration plans to "accelerate" site cleanups by bringing "more private funding to the table for redevelopment." After the president's budget was developed, Congress reached a bipartisan agreement that would boost nondefense domestic spending for the next fiscal year. In response, Trump budget director Mick Mulvaney filed an addendum that seeks to restore about $724 million to EPA, including additional money for Superfund cleanups and drinking water infrastructure grants. Agency staffing would be cut by more than 20 percent from budgeted 2018 levels, from 15,400 full-time positions to 12,250. EPA's workforce decreased dramatically in Trump's first year, as career employees left in droves while hiring was largely frozen. There are currently 14,162 employees at the agency, the lowest staffing levels since the mid-1980s. The budget proposes deep cuts to funding for rental assistance programs, eliminates community block grants, and references future legislation that will implement work requirements for some tenants receiving public assistance. Trump's proposal reduces the budget for rental assistance programs by more than 11 percent compared with 2017. It also eliminates funding for the Public Housing Capital Fund, dedicated to supporting public housing complexes, and Community Development Block Grants, which are doled out to cities, counties and communities for development projects. In a two-year agreement passed last week and signed by the president, Congress included an additional $2 billion earmarked for HUD. That addendum adds $1 billion to "avoid rent increases on elderly and disabled families receiving rental increases." It also adds another $700 million toward housing vouchers for low-income individuals and families, and $300 million to aide public housing authorities. Housing advocates say Trump's proposal is "cruel and unconscionable." "President Trump is making clear, in no uncertain terms, his willingness to increase evictions and homelessness for the families who could lose their rental assistance through severe funding cuts, and for the low-income and vulnerable seniors, people with disabilities and families with kids who will be unable to manage having to spend more of their very limited income to cover rent hikes," National Low Income Housing Coalition president and CEO Diane Yentel said in a statement. Trump's budget for 2019 shows the administration's concern about the threat from North Korea and its missile program. Trump's budget proposes major changes to Medicare's popular prescription benefit, creating winners and losers among the 42 million seniors with drug coverage. The budget also eliminates the 5 percent share of costs that an estimated 1 million beneficiaries with very high drug bills now must keep paying when they reach Medicare's "catastrophic" coverage. Instead seniors would pay nothing once they reach Medicare's catastrophic coverage level, currently $8,418 in total costs. "It will increase costs for some, while saving money for others," said Tricia Neuman of the nonpartisan Kaiser Family Foundation. "Overall it could be a wash."
School choice advocates will find something to cheer in Trump's budget. Fulfilling a campaign promise, he is proposing to put "more decision-making power in the hands of parents and families" in choosing schools for their children with a $1.5 billion investment for the coming year. The budget would expand both private and public school choice. Last year, the Trump administration also called for boosting charter and private school funding, but those initiatives didn't win the approval of Congress. The second stage of Trump's proposed border wall in Texas' Rio Grande Valley would be 65 miles (104 kilometers) long, costing an average of $24.6 million a mile, according to the president's 2019 budget. Walls currently cover about one-third of the border with Mexico, and the administration wants eventually to spend up to $18 billion to extend the wall to nearly half the border. Trump has insisted Mexico pay for it; Mexico says that's a non-starter. The proposal sets aside $782 million to hire 2,000 U.S. Immigration and Customs Enforcement officers, whose responsibilities include deportation arrests, and 750 more Border Patrol agents toward Trump's long-term goal of 5,000. The proposal comes even as the administration has been unable to fill vacancies caused by attrition. It wants to collect $208 million in fees on "legitimate trade and travel" to pay for investigations into fraud and employers who hire people in the country illegally. Trump's budget includes a modest increase of $191 million for what's known as "overseas contingency operations," or active war zones like Iraq, Afghanistan and Syria. Secretary of State Rex Tillerson had argued in the past that the impending resolution of major global conflicts would decrease the need for U.S. spending and allow the Trump administration to significantly reduce what it spends overseas. The Interior Department's proposed $11.7 billion budget includes $1.3 billion to address a growing backlog of projects to maintain and improve roads, bridges, park buildings and other infrastructure. The agency has an estimated $16 billion deferred maintenance backlog, including more than $11 billion for the National Park Service alone. Interior Secretary Ryan Zinke said the nation's parks and wildlife refuges "are being loved to death" and need significant work to keep pace with an increased number of visitors. The National Mall in Washington, for instance, needs at least $800 million in maintenance, Zinke said. As part of the Trump administration's infrastructure plan, officials have proposed an $18 billion public lands infrastructure fund to help pay for repairs and improvements in national parks, wildlife refuges and schools overseen by the Bureau of Indian Education, an Interior agency. The fund, which needs congressional approval, would be paid for in part through a projected 50 percent increase in energy leasing and development on federal lands, part of the administration's strategy to achieve U.S. "energy dominance" in the global market. The budget also includes $17.5 million to begin to implement Zinke's plan to reorganize the department and shift staffers at some agency headquarters, including the Fish and Wildlife Service and the Bureaus of Land Management and Reclamation, to the West. Energy Secretary Rick Perry said in a statement that the budget request supports the agency's push to enhance energy security and modernize the nuclear weapons stockpile while boosting funding for cybersecurity. He said it also emphasizes the role of the 17 national laboratories that do cutting-edge research on everything from clean energy technologies to supercomputing to nuclear science. The budget again proposes steep cuts to energy efficiency and renewable-energy programs and calls for eliminating DOE's loan program and the Advanced Research Projects Agency-Energy, DOE's innovation arm. Members of Congress from both parties support all the programs and are likely to restore much of the funding, although the loan program could face cuts. The Senate approved record funding levels for ARPA-E for the current budget year despite Trump's plan to dismantle it. Trump's budget again proposes $120 million to revive a long-stalled nuclear waste dump at Nevada's Yucca Mountain. The state's Republican governor and lawmakers from both parties oppose the plan. Trump's 2019 Justice Department budget reiterates the administration's priorities: fighting the opioid epidemic, violent crime and drug trafficking gangs while providing tough immigration enforcement. It seeks more than $109 million for crime-fighting efforts, including $70 million for a partnership with state and local authorities called Project Safe Neighborhoods that targets gun offenders. It would move the tobacco and alcohol-related responsibilities of the Bureau of Alcohol, Tobacco, Firearms and Explosives into the Treasury Department, which officials say would eliminate duplicative duties and allow the agency to focus more closely on fighting street crime. There's also a request for $13.2 million and 25 new positions to help "modernize" and speed up the ATF's ability to register restricted weapons, such as machine guns and suppressors, after a steady increase in applications. The budget seeks $295 million directed toward the opioid epidemic. That includes a proposed $31.2 million for eight new "heroin enforcement groups" to be sent to hard-hit Drug Enforcement Administration offices. Additional agents would target Mexican drug gangs. The proposal seeks $39.8 million for the Executive Office for Immigration Review, which oversees immigration courts and is still experiencing a backlog of immigration cases. That would include 75 new immigration judges and additional attorneys. The administration wants $25 million for a technological boost for that office, which it says still struggles with a "wholly paper-based system that is both cumbersome and inefficient." Special counsel Robert Mueller's team investigating possible Trump campaign ties to Russia is funded separately and is not affected by budget requests to Congress.